The Specials singer Neville Staple has appealed to bystanders who "tried to step in" and stop an attack on his grandson to come forward. 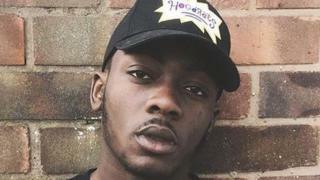 Mr Staple said he was "numb" after the death of 21-year-old Fidel Glasgow, and called for help tracing those responsible for the fatal stabbing in Coventry. Police said 100 people were outside the Club M nightclub when he was injured. One man has appeared in court in connection with the incident. Appearing at a press conference with wife Christine Sugary Staple and Fidel's cousin Kofi Staple, Mr Staple said: "There's a lot of people who tried to help and step in, so those are the kind of people we need to come forward and say what they saw, and what they did to help." Mr Glasgow died in hospital after being stabbed during an altercation near the nightspot in the early hours of Saturday. His attacker or attackers remain at large, and West Midlands Police said there was no suggestion Mr Glasgow was deliberately targeted. Det Supt Matt Markham said a large group of people had left the club at about 05:20 BST when trouble broke out. He said there were more than 100 people there at the time, but only a small number involved in the disorder. "Indeed there were a number of people who intervened and stood between Fidel and the attackers trying to calm things down and trying to prevent the disorder from taking place, so their actions should be commended," he added. Mr Markham said although there was CCTV of the scene, in Hertford Place, he was unable to say who delivered the fatal blow and how it was delivered. On Tuesday, Atikou Diallo, 23, who is accused of wounding a 23-year-old man during the disturbance, was remanded by magistrates to appear at Birmingham Crown Court on 2 October. The venue's licence was being reviewed by magistrates in Coventry on Wednesday.